Decline Meeting Requests. Just ask... What did I miss? Recently, I missed a 4 hour meeting 2 hours from my office. I got a summary from somebody who was there in less than 5 minutes. One of the biggest complaints people have about work is having to attend meetings. 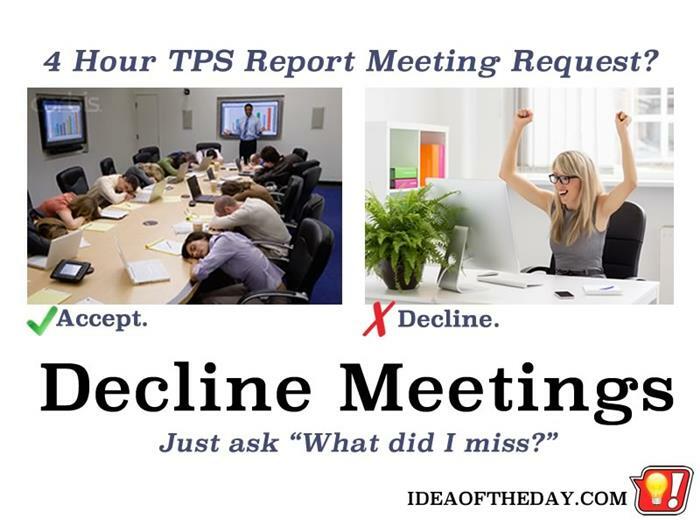 Although I've never personally worked for anybody, I have attended my share of time wasting meetings over the years. Time after time I scratch my head and wonder... what good are they? Don't get me wrong, I think there are times when a bunch of people simply need to get together to hash out a problem, but in my experience, meetings tend to be consumed by just a few people talking, and the rest wishing they were someplace else.